Although television sets wouldn't be mass produced in the United States until after WWII, by the 1920s, many Americans were already captivated by the idea of moving pictures broadcast into their homes. To capitalize on the interest in this not-quite-ready-for-primetime technology, some stores would actually set up fake television sets to lure shoppers to their windows. 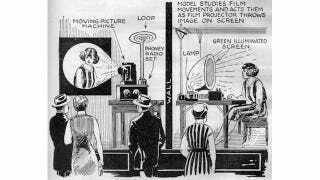 Matt Novak of Paleofuture details a couple of methods for creating fake television displays, from the August 1926 issue of Science and Invention magazine. In the example above, a prerecorded filmstrip is broadcast against a screen in one section of the window, showing an actress making various movements and expressions. The actress herself sits in another part of the window, trying to mimic her prerecorded movements as best she can while seated in front of a fake camera (actually a lamplit funnel). The hope was that passersby wouldn't notice any discrepancies between the two performances and would believe that the "camera" was truly broadcasting the actress's face to the nearby projector. Paleofuture explains another rather ingenious method of fake television creation, one that didn't require such an attentive actress.